Last week I wrote about researching at the Columbus Metropolitan Library. My other favorite place in Central Ohio is the Ohio Historical Society Archives/Library. 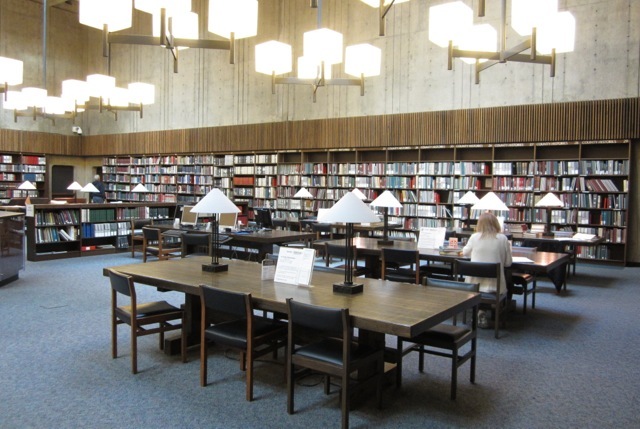 Located on the third floor of the modernistic Ohio History Center (OHC), the Archives/Library holds a massive amount of documents, books, newspapers, photographs, and other materials for family historians. Stacks of books ring the walls of the library. County histories and record compilations for all Ohio counties, some out-of-state guides, reference works, military indexes, and a large collection of Ohio city and county directories are available for browsing. Some newspapers and atlases are also on display. The majority of the library’s collection, however, consists of materials that must be paged. You’ll need to fill out a request slip for the items you want and a librarian will bring them to you. Because of this, it’s a good idea to consult the library catalog to make sure you don’t miss things of interest to you. The big wood tables provide plenty of space to spread materials out. You can bring your computer, but hand-held scanners are not permitted. In order to take pictures of documents with my digital camera, I signed a brief photography policy agreement and had to keep my flash off. If you want copies of something, the librarians will make them for you. When I visit, I tend to spend a lot of time in the microfilm room, which feels small and cramped compared to the airy reading room. 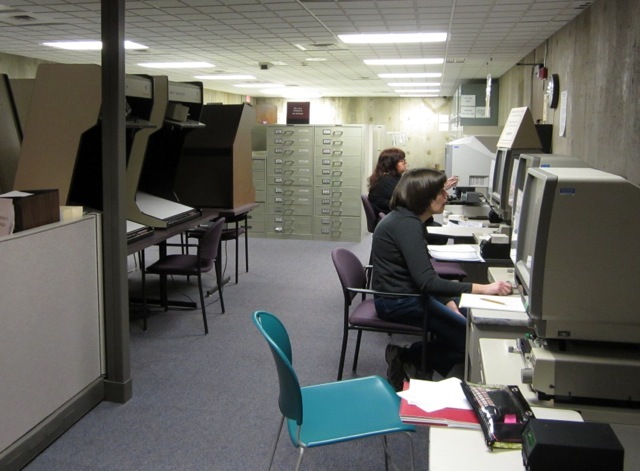 The library has extensive microfilm holdings of county records, state records, original land grants, and newspapers, among other things. To make the best use of your time, it's essential to use the online catalog to identify what you want and get the film numbers in advance. You load money onto a copy card to make printouts from the readers. It’s worth noting that the OHS Archives doesn’t hold all the locally-created records for the entire state of Ohio. It’s one of seven facilities in the Ohio Network of American History Research Centers. Each of these regional facilities is the primary repository for certain counties. 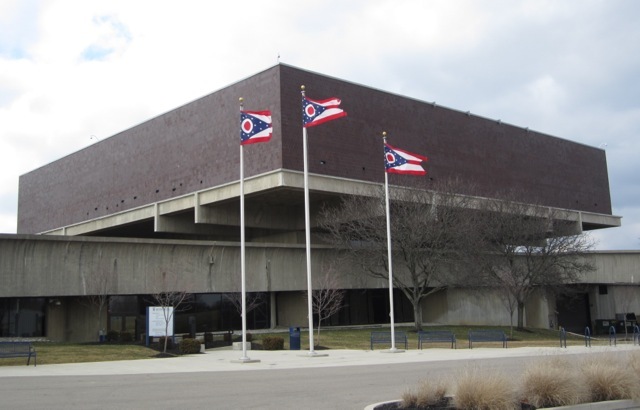 OHS is the designated repository for eight counties in Central Ohio, as well as 18 counties in Southeastern Ohio that it recently inherited from Alden Library in Athens. For an explanation and listing of all seven facilities, with links and a network map, click here. The OHS Library/Archives homepage contains a lot of helpful links in various categories. Its online catalog search is a useful tool once you understand its quirks. It helps to ask yourself, “Where would this record have been created?” That will usually be a county or state government office. Enter a term such as “Delaware county births” in the search box (don’t abbreviate county). For land grant records, enter the name of the land office, i.e. “Marietta land office.” If you get a message saying no results were found, try different search terms. Microfilmed newspapers have their own search tool, the Ohio Newspaper Index, which is not readily apparent on the Archives homepage. A huge number of papers from throughout the state are available. 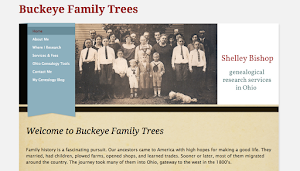 The Ohio Historical Society, Columbus Metropolitan Library, and Franklin County Genealogical and Historical Society have partnered together to offer some great genealogy classes on various topics. To read about upcoming classes, click here, or select “Genealogy Workshops” on the Archives homepage. To visit the Archives, you first need to register for a researcher’s card at the front desk, which is on the ground level. 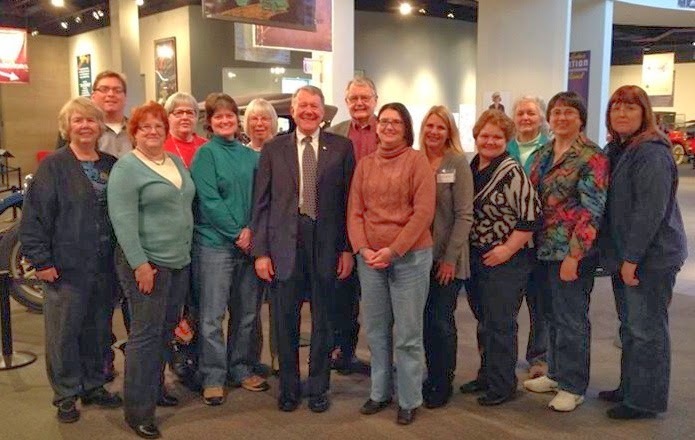 Although there’s a charge to visit the Ohio History Center museum, access to the Archives/Library is free. Parking is also free. On the third floor are ample lockers for bags and coats (you’ll get the quarter back when you return the key). No purses or bags are allowed in the library. OHC is conveniently located right by the I-71 freeway at the 17th Avenue exit, just north of downtown Columbus. It’s open Wednesday through Saturday from 10 am-5 pm (closed Sunday-Tuesday). The phone number is (614) 297-2510. If you have any time left on your way out, you might want to stop by the gift shop. On my last visit, I picked up some really cool maps--one a reproduction of the first state map in 1804 and another of the Ohio canal system. There's nothing like a good map to give help you visualize the places your family called home. I think you'll find it really is worth a visit, Diana. If you do decide to come sometime, let me know and I'll meet you there! Sounds wonderful! I'm beyond envious of actually living near such a great resource. We've wonderful resources in St. Louis, but not so wonderful for researching my Tidewater and Tennessee kin. Thanks, Susan. It is a great facility to have nearby. Though in St. Louis you have the National Genealogical Society library collection, right? Not too shabby, either! Thanks for sharing. Most of the country saw where I spend most of my free time last Friday with Reba on Who Do You Think You Are?! They did NOT show the microfilm room, because if they had you would know that yours is NOT the smallest room LOL! 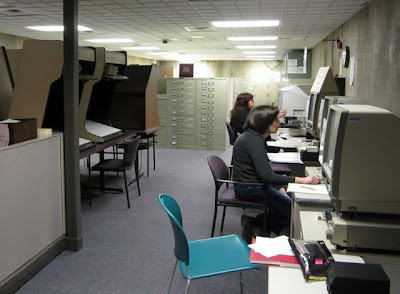 The chairs in front of our microfilm readers back up into the file cabinets that house the microfilm. They just rearranged this area too. The microfilm room used to be on the other side of the archives. Oh and are there books in that upper level of the building? I saw a library building like that once at UCONN I think it was and they had to tear it down because the part of the building that was overhanging starting sagging. It was a "neat" design in the 60s and 70s, but not very strong in the long run. Thanks for sharing! Shelley, you've done an excellent job with this post. It's so thorough. I didn't realize that there were 7 regional libraries. I knew about the one in Youngstown (my hometown area) but not about the others. I do wish they would do inter-library loan between the 7 libraries. My Jefferson County information is all the way up in Youngstown! I also think you did a good job of explaining the catalog (which I think is so difficult to use). I never make it to the gift shop: I seem to be walking out just as they're turning out the lights!